Used ATV Prices. Free Sources for the Latest Four Wheeler Prices. Guide To Used ATV Prices. Used ATVs can be great values if you know where to look. Sources of used ATV prices may not seem that obvious at first. There really are no specific used four wheeler price guides. Not to worry - there are a couple of good guides available if you know where to look. And that's what we're here to help with. The online versions of the NADA Guide and the Kelly Blue Book both have motorcycle sections. Buried within those sections are what you're after - used atv prices. If you're looking for used UTV or Side x Side prices, they're in there too. You might need a little help finding what you need so we'll give you a few tips for using each guide. Keep in mind the ATV prices you see listed are just a "best estimate" and you should just think of them as a starting point for negotiating the best price for your used ATV. There are some dealers and even individual sellers that may try to make you think these prices are etched in stone. Now you know better. OK, let's take that first step to getting you a good deal on the used ATV you have picked out. Click here for the NADA Guide for used ATV prices. This link will take you to the main page for used power sports prices. Find the Motorcycles/ATVs section near the top of the page. Click on the first letter of the manufacturer's name you want to see. Look for the maker's name and then click on the year model you want. Finally, click on the model you want. Now that you're on the right page for the year, make and model of your future 4 wheeler, there's one more step. You can select any optional equipment that may be on the used ATV. Or if you just want to see what an option is worth, that's fine too. When you're done, click on the "Get Used Value button". Like magic - there are the used 4 wheeler prices you wanted. Be sure and read the value explanations at the bottom of the page. Remember these prices are intended for ATV dealers, so they tend to be a little high. Click here for Kelly Blue Book used ATV values. This is the guide mentioned most often. I think the prices listed tend to be higher than the NADA guide. Probably why dealers like to mention "Blue Book" ATV prices. One different thing this guide shows is the trade-in value of a four wheeler. But it only has a single retail value and it's usually high. Bottom line is you really need to check both guides to get a good price bracket for the real world used ATV values. Neither guide shows a wholesale price but you can estimate it yourself. I look at the trade-in value from the Blue Book and the low retail from the NADA. Wholesale value will fall somewhere between these two numbers. That's also a pretty fair value for a used ATV from a private seller. The more homework you do at this stage, the better your chances of getting a good deal. You can check your local newspaper classified ads for a good idea of used ATV prices in your area. If you have more time, it's a good idea to call a few dealers, and check Internet classified sites. I like to look on E-bay to see what used ATVs really sold for. 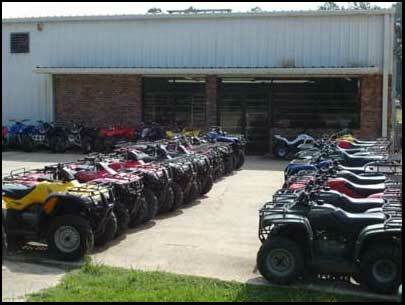 All these sources of used ATV prices should give you a good idea of what your favorite machine is worth. Since they were all free, you'll have even more to spend on it!